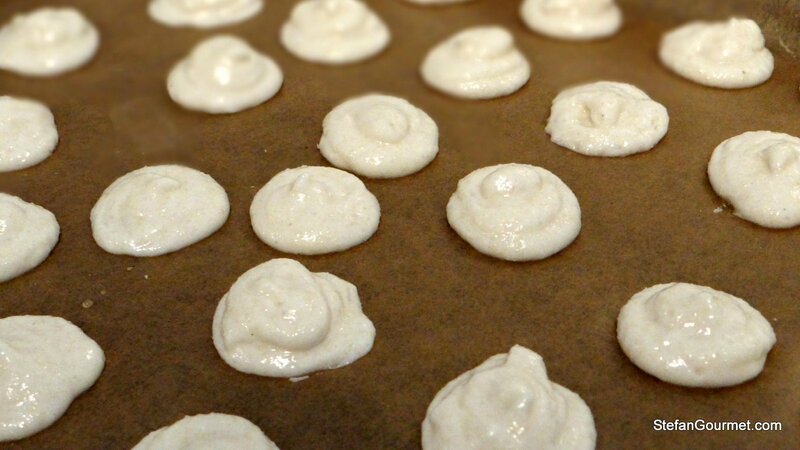 French macarons are almond and meringue-based airy cookies that are commonly filled with ganache or buttercream. The image of two macarons with filling in between has always reminded me of a hamburger, but perhaps that’s only me. I’ve had lots of macarons at the end of fancy dinners in restaurant, but until now I had never made them myself. A great post by the Cooking Chook inspired me to try making them for myself. Lo and behold: my first attempt was successful and they were outstanding stuffed with orange curd. My first attempt looked a bit rustic because I hadn’t piped the meringue very neatly, but that didn’t take away anything from the great flavor. The brittle crispiness of the shells combined very nicely with the creamy curd, and the sweetness of the almond shells went nicely with the tangy orange. Paired with a passito di pantelleria dessert wine, it was sublime. Recently Chef Mimi shared a quote of Julia Child that I agree with completely: “Try new recipes, learn from your mistakes, be fearless, and above all have fun”. This motto also helps when trying macarons. 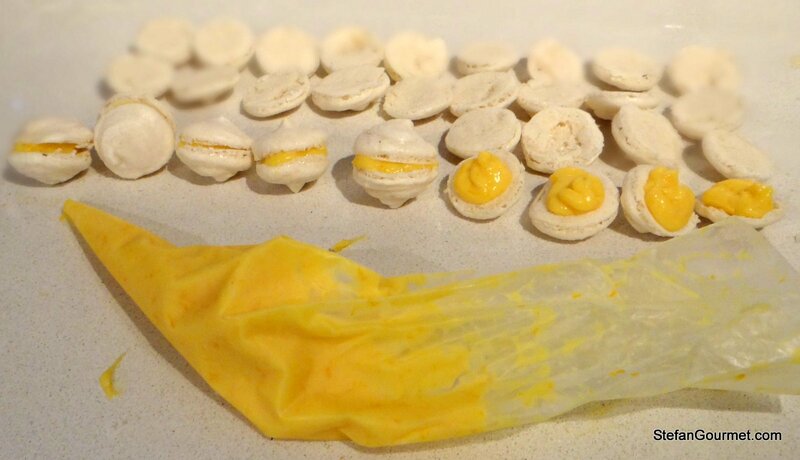 After reading about all the things that can go wrong with macarons, I was starting to think that it might have been a little brave to plan to serve the first batch as dessert to my parents. 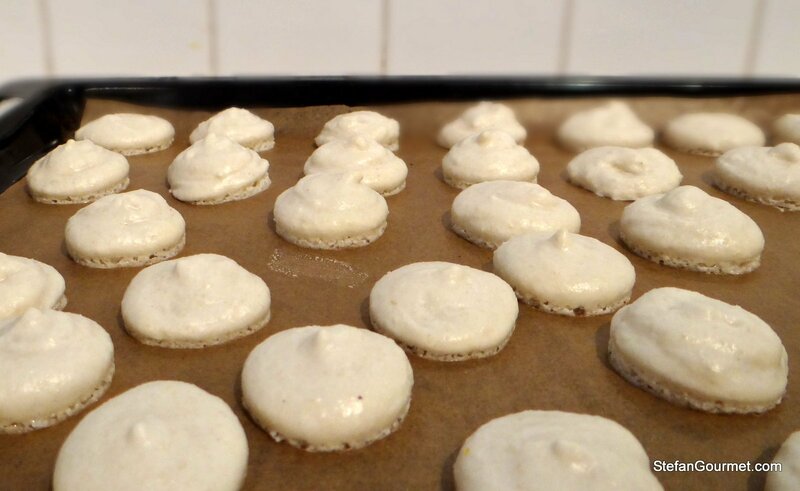 But based on all the good advice of the Cooking Chook and the troubleshooting guide that she linked to, and with a little confidence built over many years in the kitchen, it was actually quite easy to make macarons successfully the first time around. Here’s what I did, following the Cooking Chook’s recipe. Usually I provide measurements in both grams and cups/tablespoons. 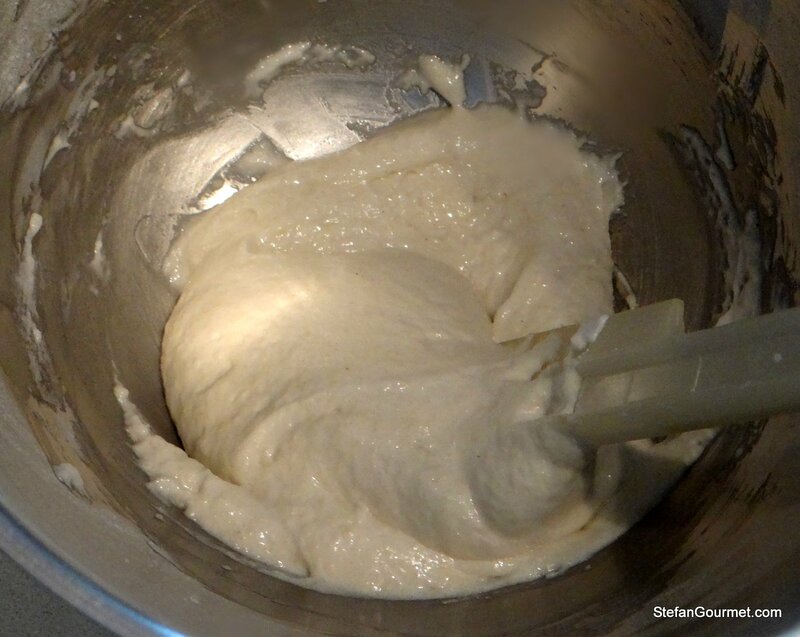 With baking this is always tricky, but with this recipe it is really important to accurately measure the ingredients so I’m not providing volume measurements. If you like baking, get scales, and use them! 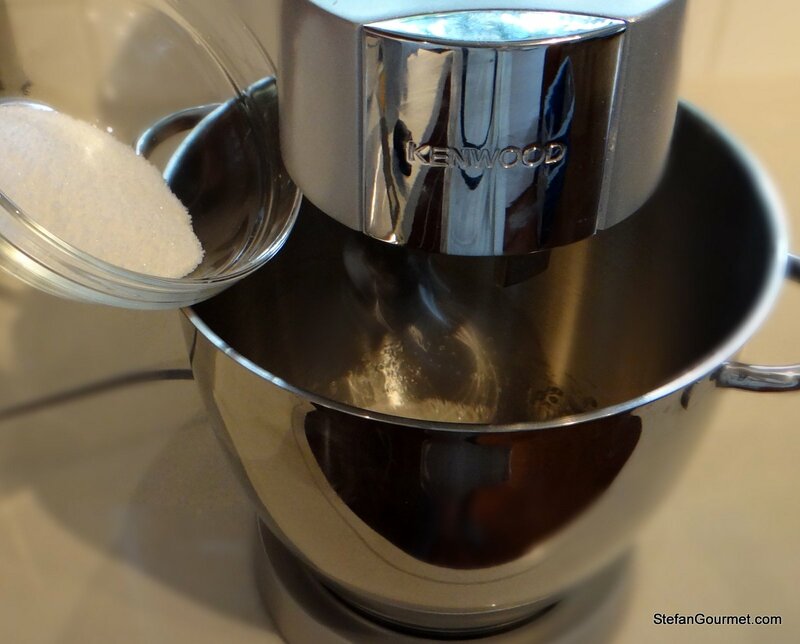 If you can’t find almond meal (almond flour), you can also make your own by finely grinding blanched almonds in your food processor. 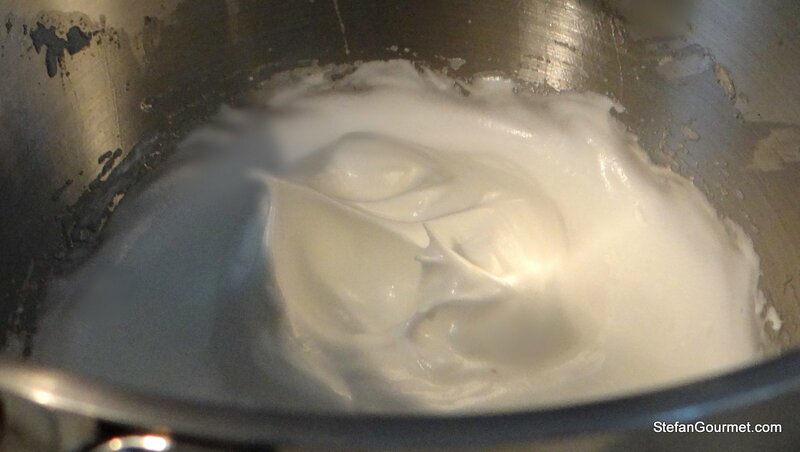 It is important to age the egg whites for 48 hours to lower the moisture content. To age the egg whites, separate them carefully, but them in a small bowl, cover with plastic wrap, punch some holes in the plastic wrap to allow moisture to evaporate, and refrigerate for 48 hours. 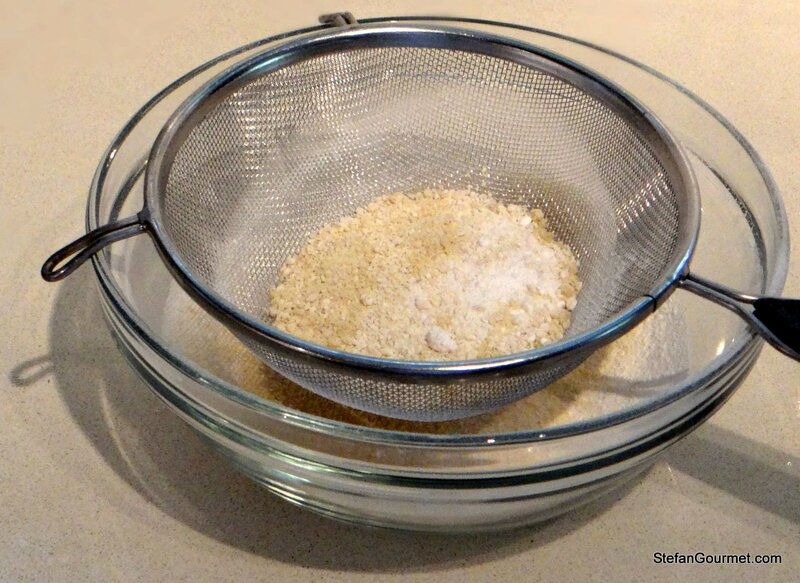 Combine the icing sugar and almond meal and sieve the mixture twice. This is to avoid lumps or a coarse texture. 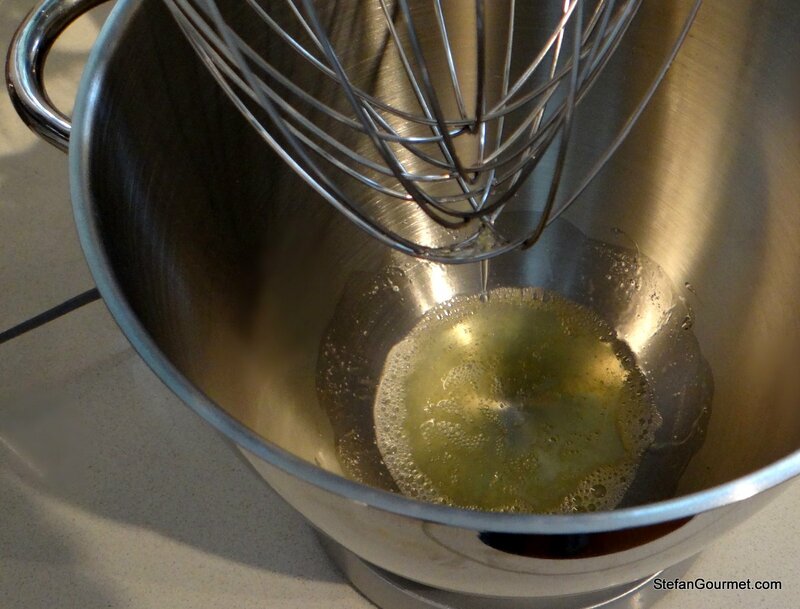 I would recommend to use a stand mixer, but if you like you could of course also beat the egg whites by hand. 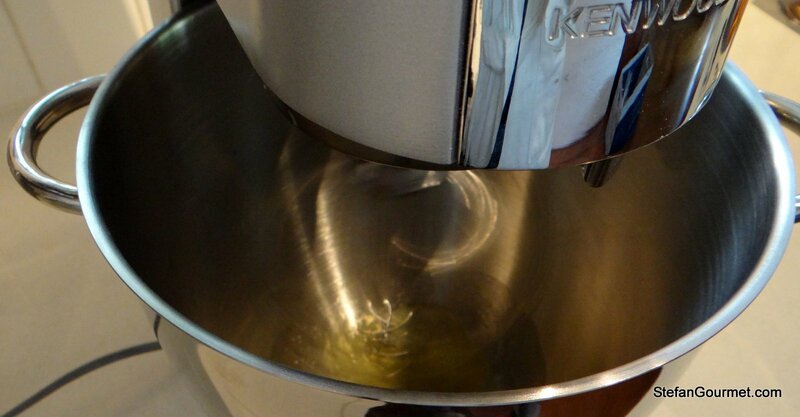 Start by beating the egg whites until on medium speed. Beat until they are foamy. Now turn the speed up to high and gradually add the caster sugar. Beat until stiff peaks form. You can check for stiff peaks by extracting the beaters. If the peaks that form do not collapse, the meringue is done. 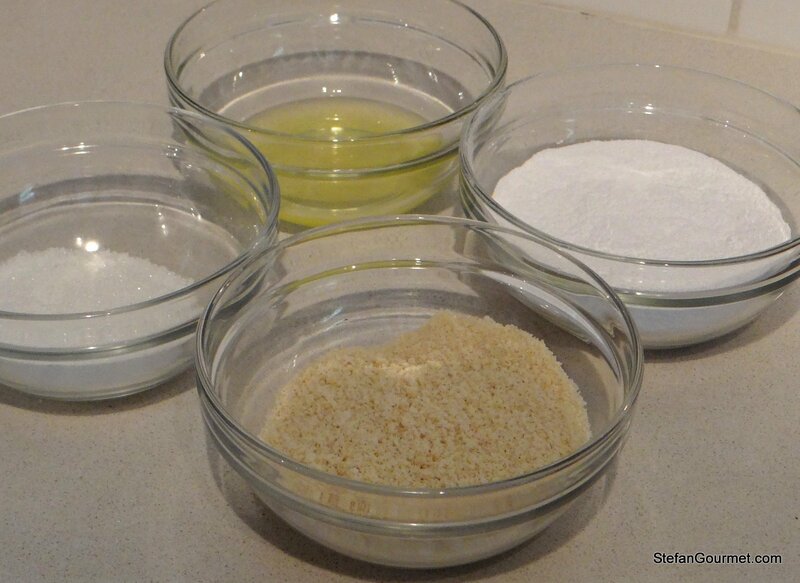 Gently fold in half of the almond mixture, folding from below with a non-stick spatula. 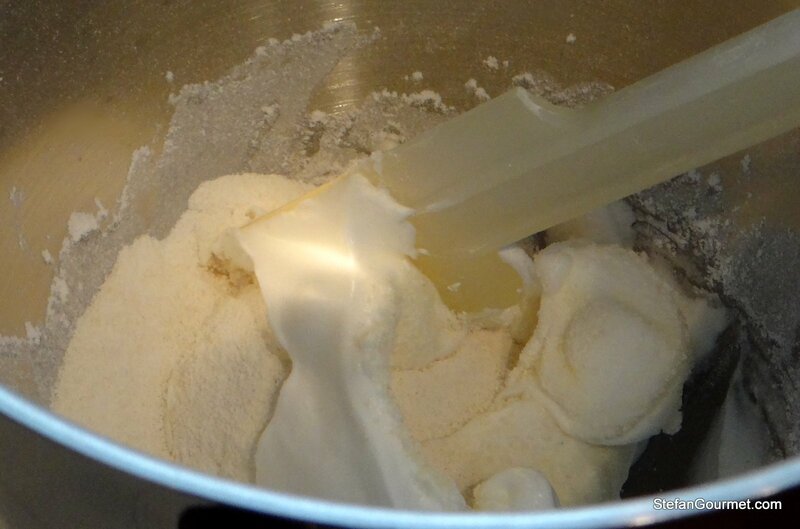 Fold in the second half until the almond meal is just incorporated and the mixture is homogeneous. Do not over mix, otherwise the meringue won’t get proper ‘feet’. Line a baking tray/cookie sheet with non-stick oven paper. 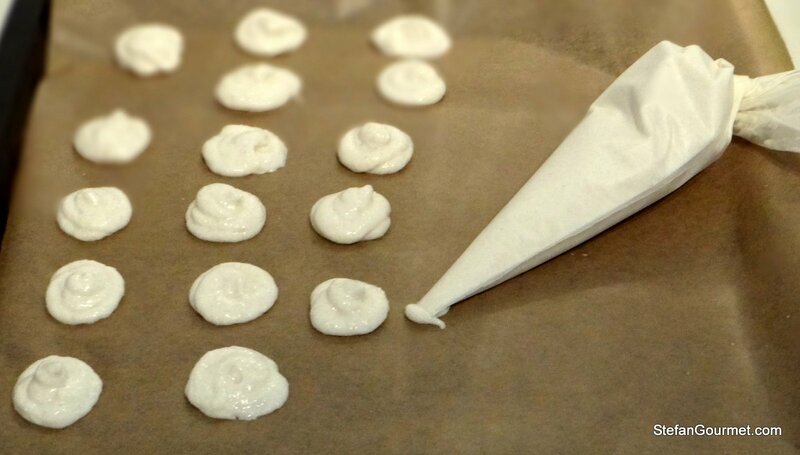 Using a piping bag, arrange circles of about 3-3.5 cm (1 1/4 inch) of the meringue mixture on the sheet. You don’t have to leave a lot of space in between, as they will hardly expand. Tap the cookie sheet firmly against a hard surface a few times to remove any air pockets. Allow them to dry for 30 minutes. Meanwhile, preheat the oven to 120C/250F (fan forced, or 140C/285F static). Bake the macarons for 15 minutes at 120C/250F (fan forced). Allow them to cool, also from below. If like me you didn’t make all of them exactly equal, pair up the ones that have a similar size and shape. Put the filling in a piping bag and put some stuffing on half the shells. Do not put the filling all the way to the edge, because then it will be pressed out when you put two shells together. Gently press on the remaining shells to finish filling them. 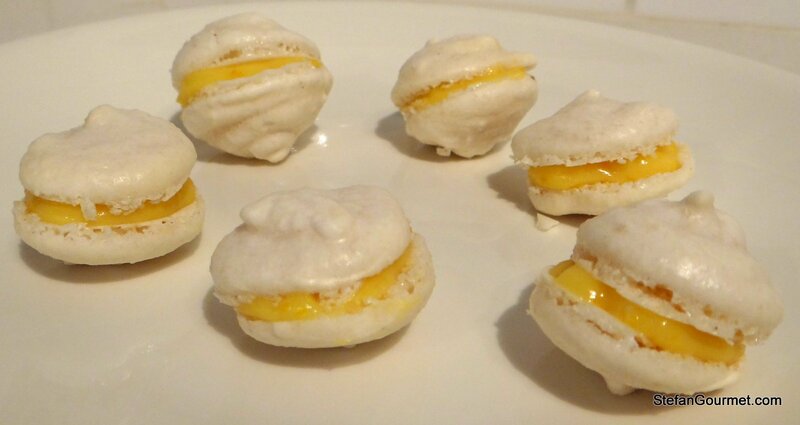 You can serve the filled macarons straight away, or store them in an airtight container in the refrigerator. This will allow the flavor of the filling to penetrate the shells, but it will also make them less crispy. Oooooo. I can eat 10 of those in one sitting! Thanks for making my Friday morning a little sweeter. Have a great weekend. You’re welcome and have a great weekend, too! P.S. Thanks for leaving such nice comments, I really appreciate it! It is mostly fellow bloggers that leave comments on a regular basis. Did you know you could create a WordPress userID for yourself without opening a blog? Such a userID would allow you to comment more easily and to show a picture with your comments, among other things. Just a thought. You’re welcome 🙂 Good luck with the macarons, perhaps I had beginner’s luck? Egg whites. I HATE dealing with egg whites. I really do. It’s a good thing I don’t bake but their are a lot of dishes, i.e. en capeado rellenos (battered rellenos) that REQUIRE beaten egg whites. It’s why there isn’t an en capeado relleno on the blog. I constantly fail with whipped egg whites. They are never fluffy enough and the is always a small amount of liquid in the bottom. I’ve been doing this for 40 years now and they are the bane of my culinary experience. You obviously have it down. Now, I’m hungry for something sweet and it’s too late and I already brushed my teeth. 😦 Oh, well. Very good skills here Stefan. I have enjoyed Lucy’s various attempts at these over the months. They are not easy. She is marking exam papers at present so I will mail her the link rather than shouting up the stairs to get her attention. She will love this post. I love macarons! they’ve been on my to cook list for a while, one of these days I’ll make the time 🙂 yours sound really good with the orange curd! thanks for the egg whites tip!